Unfortunately, in this case, the result seems subject to the law of diminishing returns, with neither star attraction Meow Meow nor composer Richard Mills reaching the impressive heights previously attained. 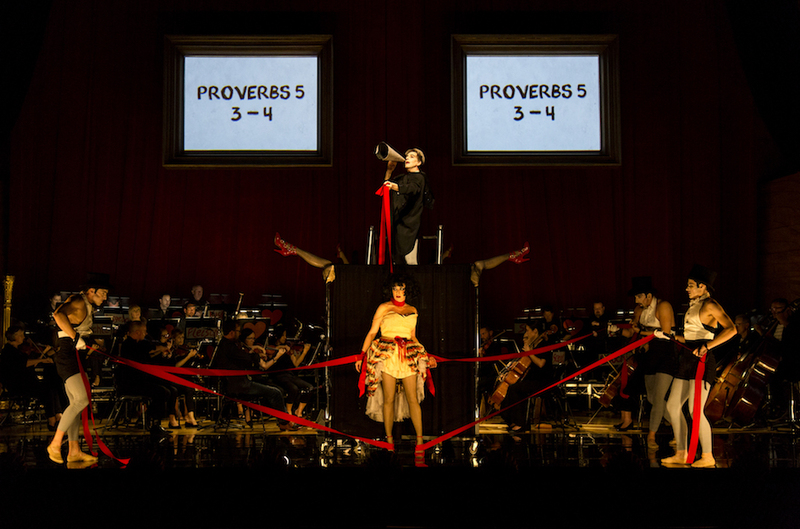 The production benefits from considerable resources, with a large contingent of Orchestra Victoria on stage and a well-furnished stage setting at premier venue Elisabeth Murdoch Hall. Meow Meow is joined by vibrant operatic tenor Kanen Breen and three brawny male dancers in a brisk series of ten vignettes lightly exploring various incarnations of prostitution across the ages. 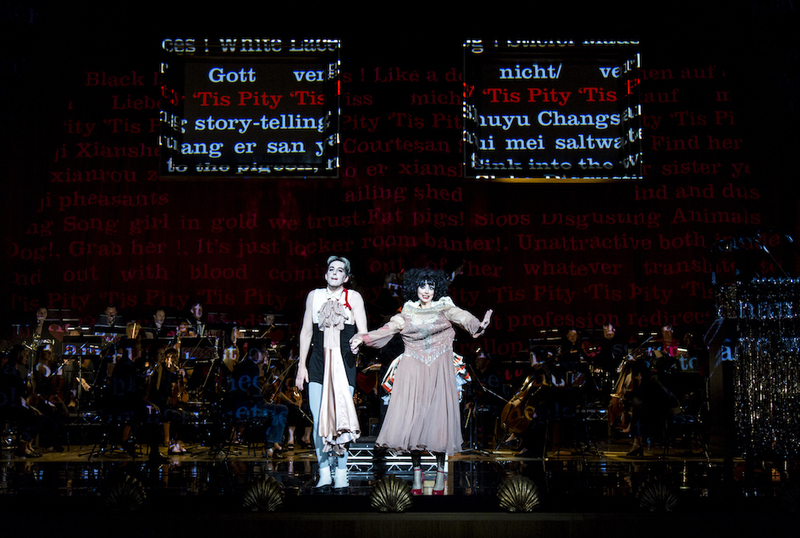 Surtitles, which are usually just plain and unobtrusive, are used as a feature of the design here, projected onto two large framed screens in eye-catching fonts. The performers select and discard props and items of clothing from about the stage as the vignettes unfurl. 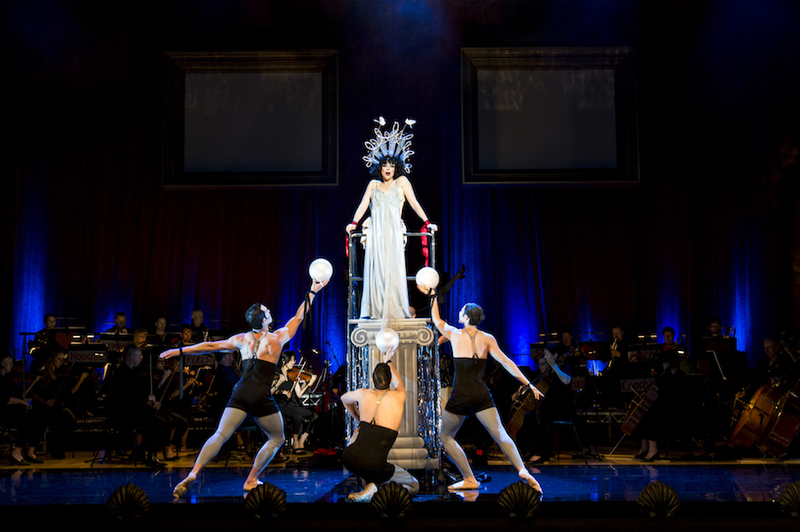 Mills, artistic director of Victorian Opera, has not only written the eclectic score, but has also arranged the orchestrations and written the libretto. Musical styles include ragtime, charleston and tango, all with a showy, quasi-vaudevillian feel. Expertly conducted by Mills, the work of Orchestra Victoria is faultless, making a significant contribution of quality to the performance. Written only last November, the work seems yet to be fully realised. At this second performance, the work of the cast seemed under-rehearsed, even if an element of this can be attributed to the deliberately impromptu feel created by director Cameron Menzies. There is a sense that there was an expectation or assumption that the larger than life stage personalities of Meow Meow and Breen would shine through and create a piece of entertainment in their own right. Meow Meow is particularly stifled by the fact that the spoken voice travels poorly in the venue, so her usual comic asides are somewhat lost. Also, the breakneck pace of the 65-minute work impedes her from gaining the audience’s sympathy with her vulnerable fragility. Meow Meow’s loveliest moment is the tender ballad she sings in the final sequence. Breen is in excellent voice, bringing a elegantly polished tone to his vocals. There is a touch of Cabaret’s Emcee in the way Breen delivers such intrinsically oppressive material with a wickedly gleeful grin. Dancers Alexander Bryce, Thomas Johansson, Patrick Weir prove as flexible in their physicality as in their dancing styles, delivering characterful facial expression as well as controlled, precise movement. 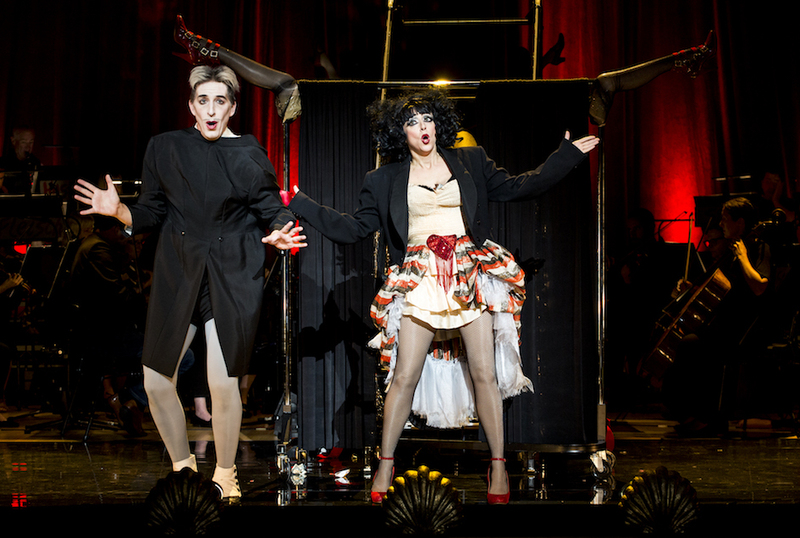 ‘Tis Pity: An Operatic Fantasia on Selling the Skin and the Teeth plays at Elisabeth Murdoch Hall, Melbourne Recital Centre until 8 February 2017. The ‘Tis Pity program can be read online.